Limited Spaces Available! For reservations call (866) 576-9151. Spaces are extremely limited this time of year so book early to ensure the date you want. Sail away to the azure waters of the Gulf of Mexico for an adventure that includes sailing, snorkeling, and dolphin watching. This tour allows guests to immerse themselves in the outdoor beauty of the Florida Keys. Guests will be able to savor the salty sea air as they sail out to sea to explore the expansive Dolphin Playground followed by a stop at one of the area’s most unique snorkeling stops. The Dolphin Playground is a large area to the north of Key West that provides ideal conditions for the Key West dolphins. Hundreds of dolphin pods make their home in these waters, playing and interacting with each other and with the daily visitors that come to say hi! This adventure allows you to see these beautiful creatures up close, as they swim and jump in their own natural habitat. These are not captive dolphins - these dolphins are wild and free, living in their natural environment. This is the absolute best way to truly admire and appreciate dolphins. And since these sea mammals are by far some of the friendliest creatures of the ocean, they oftentimes come up really close to the boat and almost seem to pose for pictures! After some time watching the wild dolphins, the sailing catamaran trip takes you out for a snorkeling adventure like no other. If the conditions are right, we will take you to the remains of a former shipwreck. If the conditions are not so great at the shipwreck, there is no need to worry! Key West offers countless top-notch snorkeling sites along its extensive coral reef ecosystem. We will take you to the best place possible to offer you an unforgettable snorkeling experience in crystal-clear, warm waters. All gear and instruction are provided by the professional and hard-working crew on board! 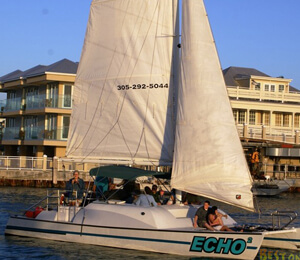 Refreshments are also provided, to make sure that you enjoy the best possible sailing, snorkeling and dolphin watching adventure available to you in Key West Florida! Will you be in the water with the dolphins? Since the dolphins are a protected species, we will encounter them as close as possible, from the boat. Often times they're close enough to touch, alongside the boat. What is the size of the boat? This sailing catamaran boat is 28 feet. The boat is licensed to hold up to 28 passengers but we never take more than 14. There is metered parking available near the check-in facility. NOTICE: This tour is unavailable until January 26th due to maintenance of the vessel. Key West Snorkeling Tours is always interested in your tour experience with us. We hope you enjoyed your tour and love to hear comments. I have been to the Bahamas many times, but Wild Dolphin Sail & Snorkel is one of my favorite trips! It includes everything that everyone should do here. As a Bahamas veteran, I can say only the best about this experience!